Coping with cancer is one of life's greatest challenges. Can you imagine the added stress of not having health insurance to pay for treatment or having to choose between medicine or groceries for your family? Imagine being too weak to walk, yet unable to afford a wheelchair or walker. Sobreviviendo El Cancer/Surviving Cancer Program helps cancer patients who are at risk of failing to adhere to their treatment plan because of financial difficulty. Through this program patients and their families receive on-going counseling and crisis intervention to overcome psychosocial and financial difficulties. Thanks to an extraordinary UMC social worker named Maria Luisa Licon who established the program, thousands of cancer patients in El Paso have received help at a critical time in their lives. Can you imagine the added stress of not having health insurance to pay for treatment or having to choose between medicine or groceries for your family? 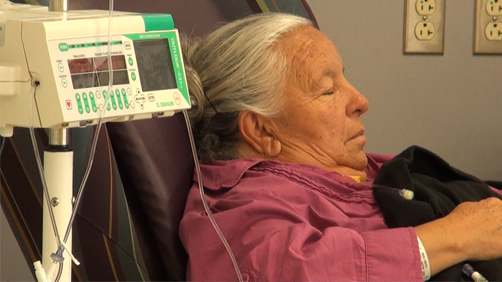 Sobreviviendo El Cancer/Surviving Cancer Program is a comprehensive program that addresses a range of issues. Every patient receives an initial assessment to determine financial eligibility for health services, medical services, and pharmacy needs, as well as factors that may interfere with a patient's care plan, such as lack of transportation. Short term housing assistance for patients unable to work while undergoing chemotherapy is also available. Sobreviviendo helps to bridge the gap from the time a cancer patient at UMC enrolls for our indigent programs and state/federal programs such as Social Security Income (SSI) and Medicare until they receive support sometimes lasting as long as three to six months. These safety net services allow for continuity of treatment and helps ease anxiety and stress. Since 2009, more than 6,000 low-income, indigent and homeless cancer patients have been helped thanks to grants by Rio Grande Cancer Foundation, Susan G. Komen, Mary L. Peyton Foundation, Moleen Foundation, Robert E. and Evelyn McKee Foundation, MIMCO, Diana I Will Live Foundation, Hervey Foundation, and Shiloff Family Foundation. Your support ensures that even more at-risk cancer patients can continue on their treatment plan. Learn more here.